Trip insurance highly encouraged. 30% of trip cost deposit required. If your cancel the trip yourself 60 days from departure then we have possibly lost the opportunity to fill that space, a deposit of 30% of the trip cost, will NOT be refunded. The 120' S/Y Indo Siren luxury liveaboard, launched in April 2011, has the same specifications as her sister yacht, the S/Y Philippine Siren. The cabins are either fixed double or twin bed, however we offer flexibility with 2 cabins which can be converted from twin to double to suit the needs of our guests. The outdoor dining area is very comfortable offering a great setting for all your meals. The dive deck is perhaps the most spacious and comfortable you will have ever experienced. 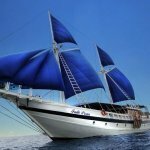 The following is a sample itinerary of dive sites we may visit during your liveaboard safari with the Siren Fleet in Indonesia. We wish to show you the very best diving possible but a number of factors can determine where we visit. Weather, tides, currents and how busy a site is with other dive vessels all play a part in the Cruise Director’s decision of which route the yacht takes. This itinerary involves some long distance travel. Whilst we attempt to ensure the number of dives we have scheduled is fulfilled, bad weather can hinder the yacht’s ability to reach a specified dive site in good time. 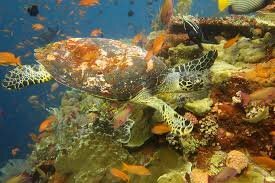 The safety of all on board is paramount and we always do our best in offering diving at alternate locations should we be unable to visit those sites listed below. Your Cruise Director will schedule up to 4 dives per day; 3 day dives and either a sunset or a night dive.